As Our Lady of the Rosary, the Blessed Virgin Mary manifests herself as our spiritual Mother and the spiritual Mother of all mankind. The Rosary is an invaluable gift she has given us, a powerful weapon she has placed in our hands. The Rosary is a “weapon of mass construction.” Praying it keeps us united to her, and aids us to live out our baptismal vocation. 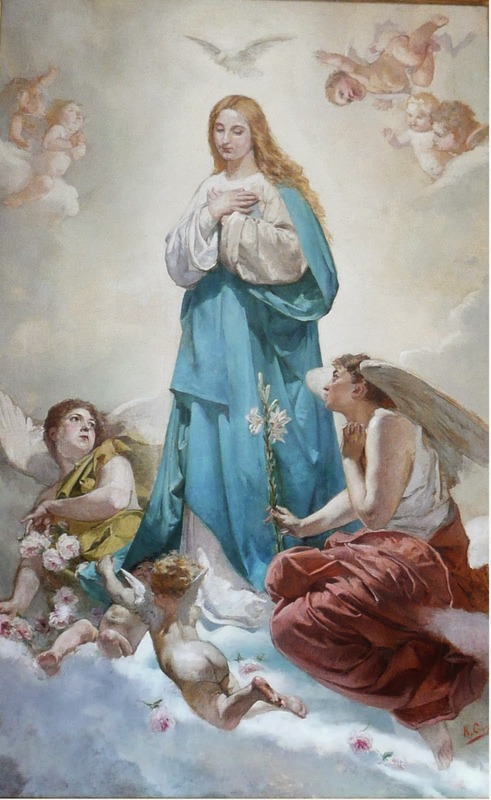 Father Frederick William Faber, noted 19th century convert and hymn composer, explained that “the Rosary is Mary’s testament, just as the Eucharist is Jesus’ testament.” We may conclude that just as we find Jesus whole and entire in the Holy Eucharist, so Mary is present in her fullness in the Rosary. When we receive Jesus in the Holy Eucharist, He unites Himself to us Body and Soul. When we pray the Rosary, Mary unites us wholly to herself. In the words of Rosary devotee, G. Ferrera, “The Eucharist and the Most Holy Virgin as so closely united that it seems as though Mary’s heart beats in unison with the Heart of her Son, Who resides in our tabernacles.” Whether we receive Jesus in Holy Communion or pray the Rosary, we can assimilate those heartbeats of Jesus and Mary, and make them our own. Praying the Rosary frequently pleases the Immaculate Heart of Mary as it enriches our understanding of revealed truth simply couched in the twenty mysteries of the Rosary – twenty engaging events in the lives of Jesus and Mary. In this crown of prayer is found the most complete Marian devotion. At Lourdes and Fatima Mary appeared holding a Rosary, and exhorted the visionaries and us to pray the Rosary because it is a universal means of grace and salvation. Let us pray the Rosary fervently to draw close to Mary, to keep her company, and to ask for the necessary graces for all humankind, for our country, for our families, for our personal salvation. Indeed Our Lady’s Rosary is an effective “weapon of mass construction” for the building of the Mystical Body of Christ. It is an effective instrument to fulfill our baptismal call. Because the Feast of the Immaculate Conception falls on the Second Sunday of Advent, the solemnity has been moved to Monday, December 9th. The Blessed Virgin promised that whatever a person asked Her for during this Hour of Grace (even in impossible cases) would be granted to them, if it was in accordance with the will of the Eternal Father. 3. Begin the Hour of Grace by praying three times the 51st Psalm with outstretched arms. Psalm 51 can be found below. 4. The rest of the Hour of Grace may be spent in silent communication with God meditating upon the Passion of Jesus saying the Holy Rosary, praising God in your own way or by using favorite prayers, singing hymns, meditating upon other Psalms, etc. Please distribute this message to as many people as you can. Remember to pray for your country during this hour. The Blessed Mother has requested that Her message be sent throughout the entire world. Please help the Blessed Virgin Mary to fulfill Her Mission well ... that all souls be drawn to God and that Jesus will be loved in every heart. This is the Perpetual song of her Heart. Let it also be ours. when Nathan the prophet came to him after his affair with Bathsheba. 4 For you do not desire sacrifice; a burnt offering you would not accept. 5 Make Zion prosper in your good pleasure; rebuild the walls of Jerusalem.